I was able to reach 70 on my Cannon Shooter very fast! In less than 2 days, to be exact (ish)! They are really, really good at training. Here’s a tip: do the quests in the Nautilus until you reach the one where you have to kill the Strange Creatures for Muirhart. Why? Because these things give a whopping 400 exp each! I stayed here until well into my 40’s, and probably could have stayed in my 50’s as well. It’s Resistance all over again, haha. 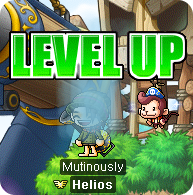 But in the minor patch today, Nexon nerfed them to 32 exp. Hopefully when Cannon Shooter comes to your version, they’ll leave it out! While raising my character, I found out a lot of things. One was about the Cannon Shooter class. They get this skill called Expert’s Inventory, which raises their inventory slots, by a lot. 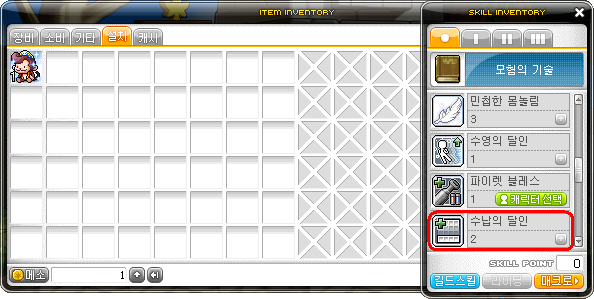 At first job, it gives you 12 extra slots in every inventory, and that number increases to 24 in second job! For some reason, it stays the same in third job, so maybe the last increase is at fourth. Nonetheless, a Cannon Shooter’s inventory is an excellent place to put all your items. 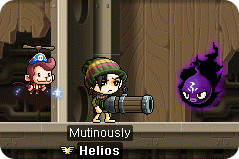 My Cannon Shooter is my new mule haha, since I was going to quit it at 70 anyways. Also, I found out that third job advancement is really easy now! You don’t have to go back to Victoria Island or answer any questions any more! Just talk to your third job advancer, go to the Holy Rock and talk to it, then defeat your job instructor’s clone! Fourth job advancement has also been changed! While doing it, Manon and Griffey’s maps become instanced so you won’t have any trouble finding your Heroic Star & Pentagon! Thank goodness the job advancements are easier. They increase ALL of your inventory slots?? OMG! I dunnid to buy extra slots now! im still a bit confused about the skill link thingy. the one where it gave +15 stats. Do you get a skill or does it amp one?? 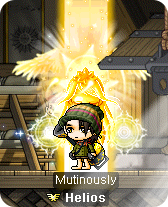 On my Bowmaster, I got a new skill in my beginner window called Pirate Bless, and it says that it is from my other character Mutinously. Max! You’ve been doing so great with the blogs, and I’m sure everybody appreciates it as much as me! Keep up the good work! P.S. You should get a youtube channel (If you dont already have one);o! Haha, I made an account but I don’t see the point in uploading stuff since every time I want to, someone else has uploaded it already haha. So is pirate bless passive? Yup, all the Link Skills are passive. Geez, no wonder Hot TIme has AP reset scrolls this time around. P.S. Just to clarify, this does stack w/ Blessing of the Fairy and Empress’ Blessing? Haha thanks, they were VIP at Henesys I think. At fourth job there won’t be any increase. max, can u get more than 1 link skill? Also, can u change it then link it to another char? Not sure, there’s only one Link Skill out in kMS right now so I can’t really check. 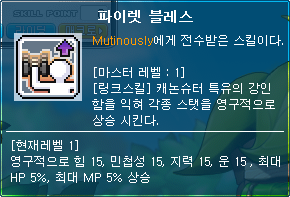 Once the kMSt term starts I’ll try though! Yes you can unlink a skill, but you can only change the character the skill is linked to once per day. hmm kinda cool u can hold alot more on cannon shooters than other classes. Yea you can have all three link-skills onto on character. Mercedes: 10% extra exp, and a return skill to the elf hero’s home town. 1 year until gMS gets this. Max, ur just like Spadow! Keep it up! And oh my goodness I NOW WANT A HUMAN STORAGE. The Umbrella Chair from the Event is untradeable. Quest nerf’ed from 400 EXP to 32 EXP 😦 Darn it, didn’t even get to enjoy it. Congratulations on 70 by the way. Hmm, can anyone tell me whether cannon shooter use bullets? Or is it only some of the skills do? and some of the skills do not? Demon Slayer Clarification & Thief/Pirate Jump (UPDATED) kMS ver. 1.2.136 – Cannon Shooter & the Legend Festival!